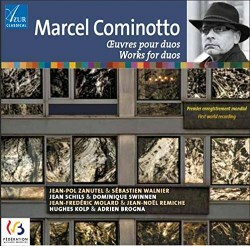 It’s not that long ago that I reviewed a CD of works for solo instruments by Marcel Cominotto. In this volume he turns his hand to duo combinations. Like the previous release, the music is challenging, but its interest lies in the resourceful scoring and varied instrumental blends. Marcel Cominotto was born in Chênée, Belgium in 1956 and studied at the Conservatoire de Musique in Liège. In 1972 he was awarded a diploma for piano with the highest distinction, and two years later the Government’s virtuosity prize. It was then on to Geneva and Cologne, where Nikita Magaloff and Aloys Kontarsky put the finishing touches to his studies. His career focuses on performing, teaching and composing. He has made several recordings as a pianist on the Azur Classical label, featuring composers such as Liszt and Schumann. One of the works featured on the previous solo album was Espaces improbable for solo cello, given a compelling performance by Sébastien Walnier. Here he is joined by cellist Jean-Pol Zanutel for Storia per due celli.... The story, in the words of the composer, “...takes listeners away on an emotional trip”. His aim is to merge the two instruments into a single voice, yet I did feel that, throughout, the two protagonists each retain their own character and identity. It’s very much akin to an intimate conversation. Cominotto seems to be very fluent and adept at writing for the instrument, and he employs such effects as pizzicatos, harmonics, double-stops and swirling tremolos. There’s a doleful melancholia underlying the narrative and, towards the end, the performers’ pleading double-stops truly convey angst and pain. The composer puts his skills as a pianist to good use in the virtuoisic ‘diptych’ which follows, for piano and four hands. The two pieces were written especially for Jean Schils & Dominique Swinnen. Anna-Morphoses has the couple’s daughter in mind. Anna is witty, serious-minded and determined, and the music expresses these traits with complex rhythms, counterpoint and dissonances. Facéties focuses on their son Pablo, a facetious and lively boy. Cominotto employs a vast array of colourful sonorities to portray this vibrant and sparkling personality. I find this second piece less complex and more accessible. The title Apollo is a playful reference to the Gemini Duo and the 1960 moon race. The piece exploits the notions of energy, space and the Universe. Cominotto forges a minimalist approach, with small explosions and big bangs emanating from the bowels of the earth. The duo, who’ve been performing together since 2001, inject plenty of vitality into this colourful, kaleidoscopic canvas, where dark, sombre shade alternates with diaphanous translucency. The Six Preludes for 2 guitars specify an eight and a ten-stringed instrument. Apparently this opens up the possibility of creating quarter-tones and micro-intervals. The first prelude is a perpetuum mobile, lively and motoric. I particularly like the jazz-inflected second with its gypsy temperament. The third babbles garrulously, but has a more pensive middle section. The fourth is terse, percussive and declamatory whilst the fifth, by contrast, offers the listener some soothing balm. The final prelude is mechanical and relentless, and I’m most impressed by the metallic sonorities the performers effectively achieve. All the performances have been warmly recorded. Azur Classics booklet, in French and English, is very well produced and contains a wealth of background information, not only on the music, but on the participants too.